People of all types came out to celebrate, mourn and honor Steve Jobs after learning of his death yesterday. 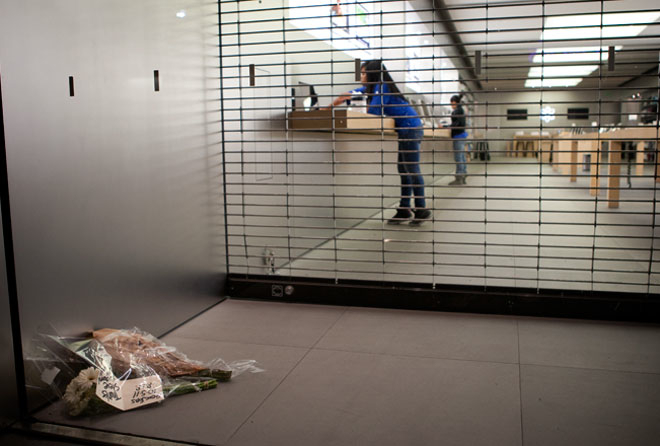 Some converged on local Apple Stores or flocked to Apple’s Cupertino campus, while others paid their respects online. Several dozen Apple and Jobs fans stopped at the San Francisco Apple Store over the course of an hour Wednesday. Others were kneeling on the sidewalk to write their thoughts, best wishes and favorite quotes on multi-colored sticky notes, which they placed on the glass windows at the front of the Apple Store. Others stopped by the store after finishing up their work day. 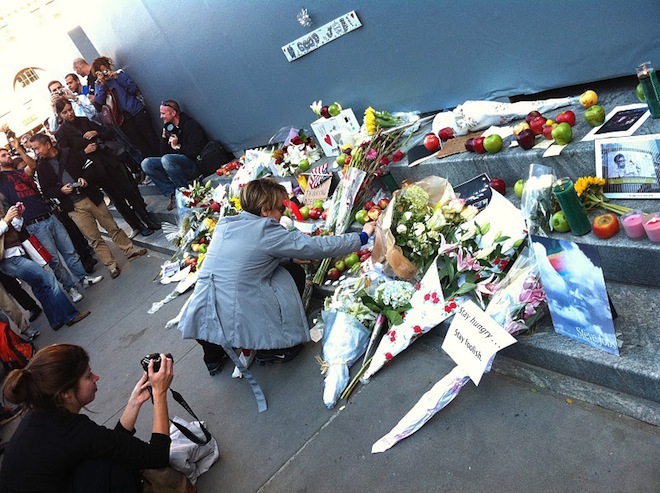 Fans set up a similar memorial in front of New York’s Fifth Avenue Apple Store. Bouquets, notes, photos and apples surrounded a “Keep Thinking Different” sign. At Apple’s campus, a number of people came to honor Steve’s passing. 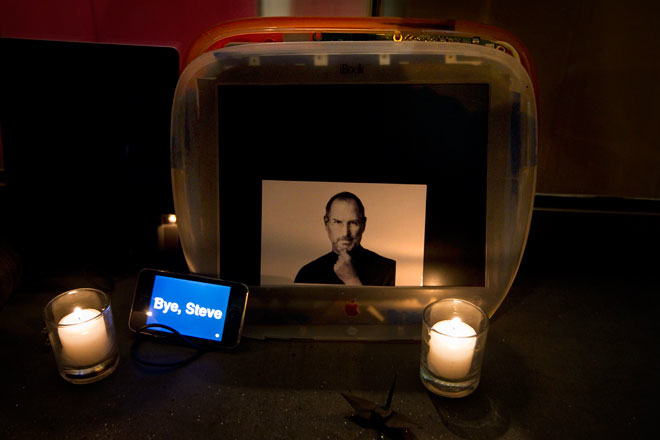 A shrine was created with flowers, balloons, candles, cards and posters — even a white iPad illuminated with Steve Jobs’ image on the Apple home page. Former Gizmodo editor Brian Lam took the opportunity to write a detailed post revealing what really went on between himself and Steve Jobs back in 2010 when Gizmodo got a hold of a prototype iPhone 4 prior to its release. “Sometimes,” he wrote, “I wish we never found that phone at all.” The Wall Street Journal’s personal technology columnist Walt Mossberg also took the time to share his account of personal interactions between himself and Jobs, a series of phone calls from the late ’90s when Steve had recently returned to Apple. Many learned of Jobs’ passing on one of the very devices that Jobs created, an iPhone, iPad or MacBook. 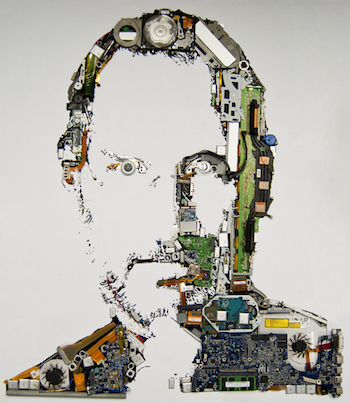 “I was reading about the iPhone 4S on my iPad 2 when I got a push notification about Steve. I could feel the loss of the legend,” Twitter user Cameron Love said. Several Wired readers, like Oojal Jhutti and Mint Foundry, felt inspired to make memorial websites or videos. Others across the internet decided to watch or re-watch Steve Jobs’ inspirational 2005 Stanford commencement address, which the university made available on YouTube. Jezebel blogger Whitney Jefferson remembered Steve with music. She created a Steve Jobs playlist using the songs she already had in iTunes that were used in Apple commercials. Some publications, like The Atlantic, provided open forums where commenters could share their thoughts and memories, and Reddit was flooded with quotes and well wishes. Ex-Apple designer Mike Matas uploaded a series of photos that provided a glimpse into the fun side of Steve Jobs: images of Steve playing with Photobooth in 2005.